I heard a charming and insightful interview recently on the Design Matters podcast. The guest was the man with the coolest name in history: graphic designer Roberto de Vicq de Cumptich. “Graphic design will save you!” is his mantra. There is a lot of good stuff about the importance of design as something that makes people feel happy and intelligent, and in so doing can bring together varied parties represented by the design, and bring together an audience. He also tells a few good stories. In a lead-in for why he wrote his alphabet book Bembo’s Zoo, he tells about how on his wife’s side of the family, the adults only exchange hand made gifts at Christmas. That sounds great in theory, but he and his wife are the only ones who have the tools or the talent to pull it off. One year they received what they called “the Birdhouse of Doctor Caligari.” Nothing lined up and it just looked like a wonderful artifact of German Expressionism. The only connection between that story and what follows is the presence of a birdhouse, but any chance to say or write Roberto de Vicq de Cumptich is a chance worth taking. Also I like the image of Doctor Caligari as a backyard tweety bird. The weather is finally turning towards a real spring in the DC area, and I got some plein air practice yesterday while visiting my parents. 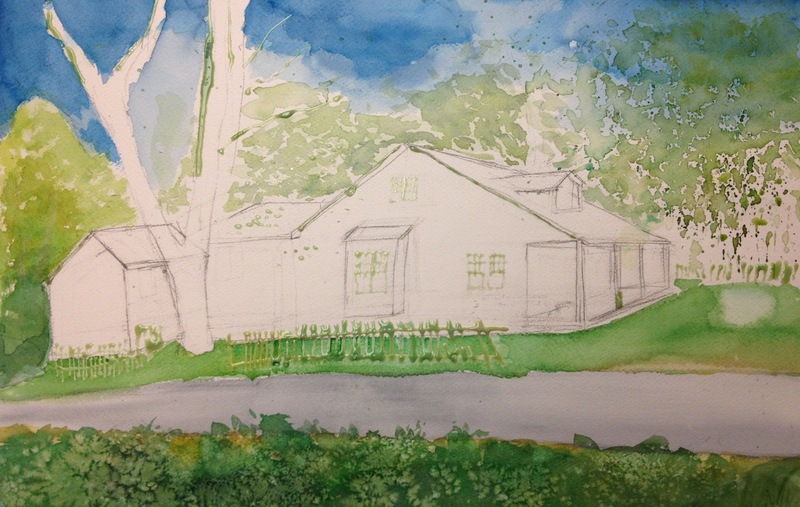 My dad designed and planted a beautiful shade garden in the back of their house, and I’ve wanted to paint back there for a while. Much of the attention grabbing plants haven’t come in yet, so I picked a birdhouse to focus on and filled in some background foliage to structure the composition. Doing so probably made this look more like a summer painting. I haven’t done much plein air painting, but I enjoyed it and learned a lot from this attempt about patience and trusting myself. While the bird house was interesting in and of itself, I wonder if it draws enough attention. 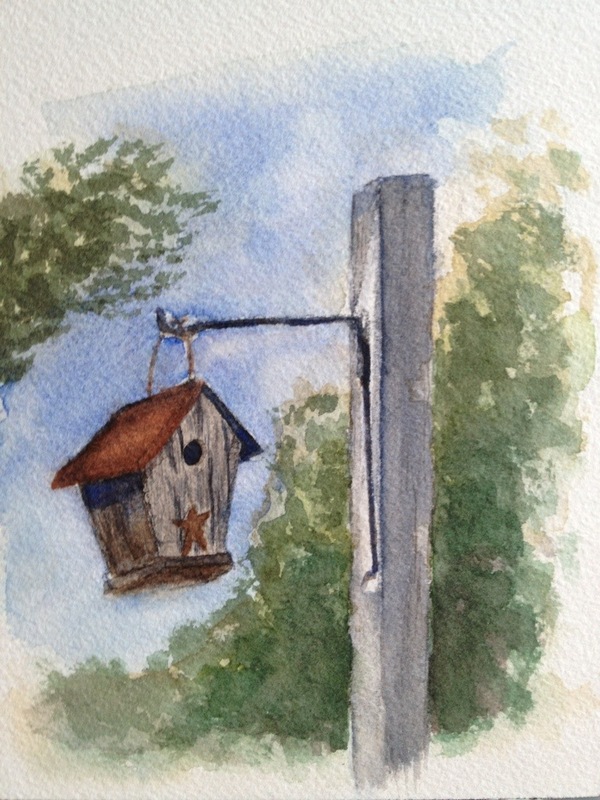 As I look at the painting, I find my eye drawn to the light and shadow on the pole, not the birdhouse. Maybe a little more light on the roof and some darker areas in the foliage would help focus things a but better. That being said, I will feel more confident next time knowing that it came out all right and Doctor Caligari wouldn’t have a great interest in this birdhouse.